SEGA Europe has just unveiled a new trailer for Xbox 360 Kinect exclusive title Sonic Free Riders. 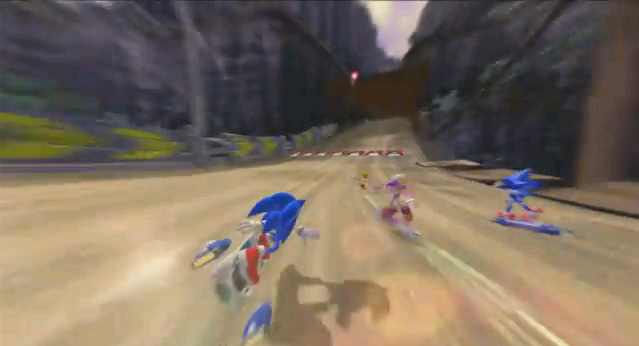 The trailer showcases a variety of tracks, including some we’ve never seen before, such as a volcanic themed area and an ancient ruin themed area. A new piece of music is played in the trailer and fits well with the series usual fare. The trailer focuses on introducing viewers to the game and how it works with Xbox 360’s new device, such as turns, speed, jumps, ring grabbing and track specific motions like swimming. Black Spy at the SSMB has spotted a new character joining the series in the above screen-cap. Yes, it seems Metal Sonic had so much fun competing in Sonic & SEGA All-Stars Racing that he decided to take part in this game, too. Thanks to Woun at the SSMB for the heads-up! A bunch of new screenshots of the various tracks shown in the trailer have appeared at Xbox.com, too. You can check them all out below. Sonic Free Riders will be available when Kinect launches November 4th in the U.S. and November 10th in Europe. … Damn I’m slightly interested now. lol at 0:20 sonic sounds like his voice from Sonic CD. My favorite Sonic chracter is in the mix now? Neat! As if anyone is going to be able to do any of those things the kid in the video trailer. They’re trying reeeaaally hard to sell this game. Even I love Metal Sonic, but the whole Kinect idea wreaks of “gimmick”, and after the initial run, even if someone enjoys a play-through of the story mode, no one’s gonna feel like playing this game over and over again. Metal sonic, cool. but still miss the Chaotix. Heck-heck-heck YEAH! Oh boy! My favorite blue metallic Sonic rival, Metal Sonic, is gonna be playable! I’m-a gonna love playing as my favorite blue robot boy! Now that Metal’s been confirmed, I remember news saying this game, like the last two, will have a story mode. Eggman was a character in the story mode of the last two games. Since it is likely that Eggman will be in this story mode, I wonder if Metal Sonic is gonna have a role in the story alongside his creator? I’m very happy to see that Sega is using Metal Sonic more. Hopefully this means he will become a more prominent character in the series. Sonic: Oh, yeah! Feel the wind! Wave: Jet, that hedgehog won’t get out my way. He zooms to beat Sonic. Sonic: Knuckles! Did you put that banana on the field? Knuckles: Eh, no I did not. Jet: You’re weird, man. I guess I will pass. Sonic: Come on! It’s much so fun! Tails: Wave! Did you put the bombs inside my rings? Jet: I’m leader of the speed! Beat that Sonic the Hedgehog! Sonic: You son of b*tch! Jet: What? Something’s wrong me? He smash Jet into Big. Big: Weee! A little birdie! Amy: See Sonic? This isn’t so bad. We are together since Sonic Chronicles. Sonic: Um, cool. Don’t be crashed some robot dudes. Metal Sonic: Um, we’re dudes, Sonic. Amy: OMG, that blue robot needs more attention. Sonic: Me too let’s finish the race together! I bet Jet has his girlfriend, Wavey. Wave: But we’re not together! Jet: I hope I could crashed some trees Sonic would laugh at me. Jet: Shut your dirty mouth Sonic! Sonic: Sorry, Tails could help me too. Shadow: YOU STOLED MY BIKE FROM SHADOW THE HEDGEHOG! Knuckles: No way Shadow, this was MINE! Shadow: NOW YOU DONE IT! CHAOS SPEAR! Knuckles was beated by Shadow. Jet: I wish I could ride some dinosaur bones. Sonic: Wow, just like I was speeding through Empire City! Tails: Um, that was Sonic Unleashed, idiot. Tails was caught by the traffic light. Knuckles: I’m touching all the billiboards with says Sonic was stupid SEGA mascot. He smash Knuckles into the shops. Storm: Look! I’ve catch the ball! I think that you’re just about ready to write a fanfic. Is Sonic and Amy holding their hands? I knew it this going be happening! SONAMY FOREVER! I really hope there’s Sonic/Amy scenes in the story mode. I just saw Shadow, Cream and Rouge. But Metal Sonic! I’m so love this game! The graphics and models are way better than that damn Sonic Riders Zero Gravity. SEGA did good job on this game. The new voices are going be great! I hope Kyla Pratt will voice Amy Rose, and some old Sonic voices are coming back I hope. Jack Black as Knuckles! @Ryan, you really need to find somewhere else to post your ideas. It’s nice that you are a devoted fan and such, but come on. Unless you are trolling of course. METAL SONIC AWESOME!!111!! I want this, but I wish Shad, Rouge and The Chaotix could be in it too. A terrible fanfic at that. Man you guys are just mean. .__. Now back onto the trailer.